Situated at the eastern edge of the Siberia, Kamchatka peninsula is one of the most remote regions of Russia. Stretching almost 1000 km northwards, it was created by immense pre-historical activity of numerous volcanoes. Now the remnants of that activity keep into the chain of mountains at the east part of the peninsula, between the Kamchatka river valley and the Pacific coast. On such a large territory there are only 400000 locals (moreover, almost 300000 adjusted to the capital – Petropavlovsk), easy to imagine possibilities for wild nature explorers. 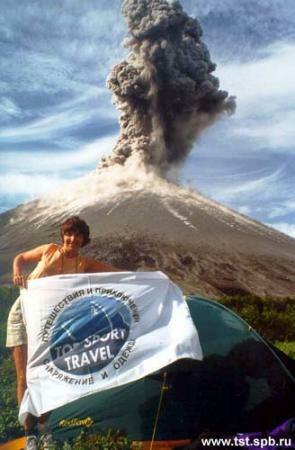 Firstly, it is visiting active volcanoes to observe different forms of volcanic activity, such as geysers, hot springs, fumaroles, mud pots, etc., and even to catch a volcanic eruption, which is a real chance here. The region of high volcanoes on the central Kamchatka (including the highest active in the Europe – Asia – Kliutchevskaya Sopka 4850 m) is the very place for hiking, ski-touring, climbing. Nearly every time one of the most active volcanoes there (Kliutchevskaya, Bezymyanny, Shiveluch, Karimsky) is explosive. Rafting the rivers during the period of spawning salmon allows picturing bears catching fish. The climate on the south is marine, with lots of precipitation statistically, that is why the snow on the slopes of volcanoes doesn’t melt till June- July. In the central part of Kamchatka the climate is more continental, with warmer summer and cold winter, and snow there begins to melt in April (except high volcanoes where it may rest the whole year). The best season for climbing volcanoes, fishing, picturing bears is August-September (south), July-September (centre), for ski-touring and ski-climbing – April-June (south), April-May (centre). Some volcanoes have long slopes with large elevation gain, covered with the snow nearly always. Except the well-known Valley of Geysers, there are other places of the same beauty and uniqueness: the craters of Mutnovsky volcano, where lots of volcanic activity is concentrated at the same place, the region of Karimsky volcano, one of the most active on Kamchatka, the plateau at the foothills of Tolbachinsky volcano with new craters, a result of very long and powerful ash eruption lasted 2 years (1975-76), etc. To plan Kamchatka visiting, it is necessary to take in consideration that the meteorological conditions on the peninsula are rather complicated. Here may be long periods of foul weather and snowstorms. Except the only main road, there are practically no good roads on the peninsula and the fulfilment of the ski-tour programs sometimes demands the using of helicopter. Even in summer there may be strong dependence of the weather, and roads may become impassable fter havy precipitation. There existed a few rivers recommended for watching bears. The Opala river on the south and especially its left tributary – the Savan, remain for a moment a real oasis were bears are not so much afraid of people, and, if You are following the rules, are not aggressive. The season for this adventure is July- September (depends on the spawning conditions).